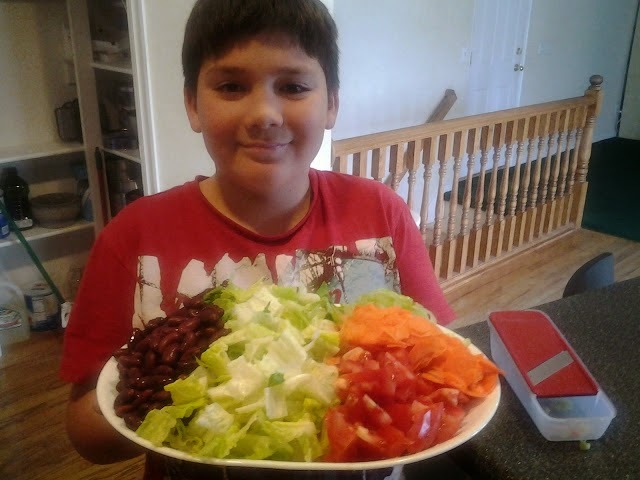 My Boy, he made this Salad Platter on his own, from my 3 kids he is the less picky. He rocks!!! 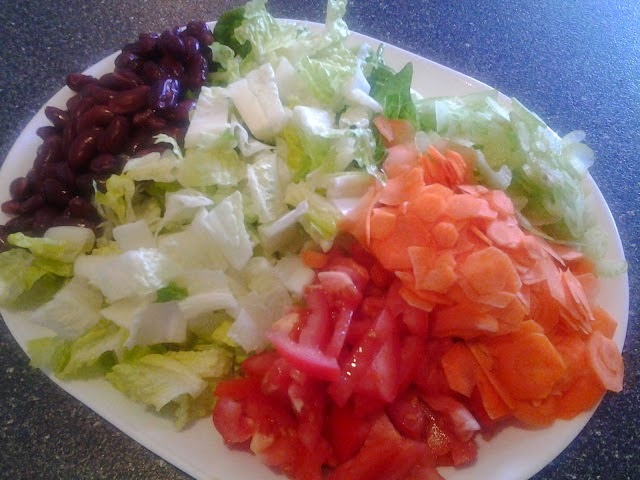 I need and want to eat salad every day, because is a healthy habit that I want to impose in my daily life. But doing things on hurry, sometimes makes me put my greens aside, not intentionally of course. I had been trying to correct this, because the absence of greens on a daily basis have consequences. Sometimes I get all my dinner going, and with the thought that salad is easy and can be done in 1,2,3 when I'm done with the most relevant of lunch or dinner. But it does not happens like that, by the time we sit down I have no salad done and I get lazy to get it done. Another reason is my kids, they don't enjoy the greens as much as I do, neither does my husband, I quote his favorite phrase "the cow I eat already ate all her greens for me", so my good intentions get bump down. 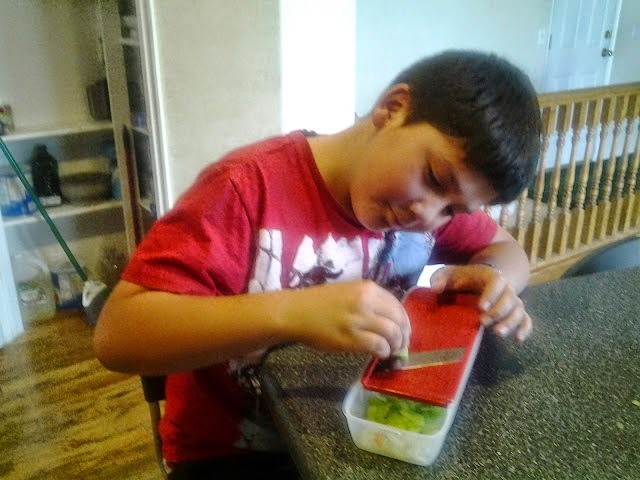 Have your kids help you on the task, they will be more likely to eat the vegetables they cut. What I have notice is that, if I make a large platter of greens and arrange the vegetables available that day on the sides of the platter, I do better. Kind of making it my priority. For dressing salad is easy because my favorite is fresh lime, olive oil and salt and my kids like homemade ranch. Now you might think that it can go bad after a day or two and wilt a bit, but if you cover with a wet paper towel and plastic wrap with little holes, to allow breathing works for even 4 days, but is gone by the third, waste it does not become a problem. Thinly slice or julienne carrots. Use a really good mandolin. Diced or Cut tomatoes on wedges, no seeds. Go for Roma Tomatoes. A can of beans, pick your favorite and make sure you rinse and drain them. your pick of a nut, or sunflower seed, keep them on an airtight container. beets, fresh will be awesome, but because of time and price I go for a good can brand. take a pick from croutons, home made tortilla strips, or crunchy noodles. Keep them on airtight containers. I will say those are the basic staples, give or take. You always need to have dressings, make sure they are either a good brand with no preservatives. Homemade is best choice. Well, have fun making salads, and if someone reads this and knows of a place where I can get a nice tray or tapper ware that have separations for my vegetables, please, please tell me!! !